Local Barn Owl – Our Maui Resident. 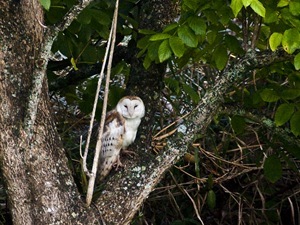 We’ve had a barn owl visiting our property in Maui for 8 years now. I wonder if its the same one still. I was walking down the drive at sunset, taking a stroll, and I should have had my camera with me because the barn owl flew right over my head. He landed in a tulip tree about 100ft away, and seemed quite settled there, so I headed back to the house to fetch my camera. AND yes ! he was still there when i returned..
What a Beautiful bird ! Next time I should have my camera with me.. Tomorrows another day !